It's amazing how a sharp rise in the stockmarket can change people's opinions about the economy. With the S&P 500 at its highest level since May 2008, even votaries of doom have turned into cheerful optimists. 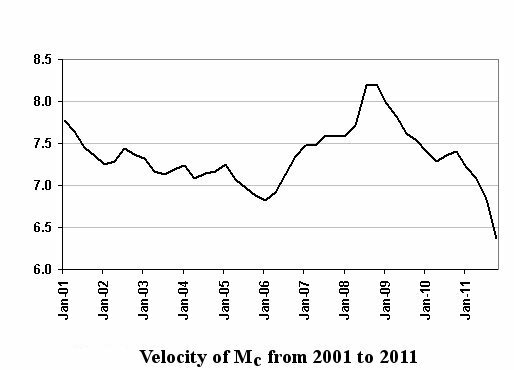 Alas, our graph for the velocity of Mc shows quite the opposite. It shows the velocity at its lowest level in the past decade, indicating that the US (and with it no doubt a large part of the world) is heading for a crash followed by a recession. Or will it be a Depression?